Hello!! 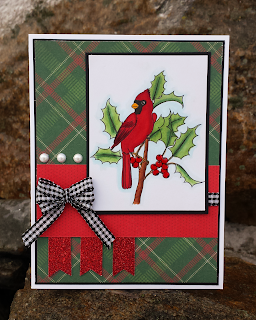 Today's card uses the December freebie over at Beccy's Place. I left off a sentiment this time so that this card could be used for multiple occasions like Christmas, Birthday and Thank you ect. It's hard to tell in the picture but I added some glossy accents to the berries. Challenges I'm entering are listed below. Thanks for stopping by an have a great day!! Beautiful card Janice, I love the fabulous paper you used in the background. Tartan always makes me think of traditional Christmas celebrations with lots of snow, pine trees and reindeer running around outside. Pretty much the total opposite of an Aussie Christmas! I like the addition of the red flags and the black and white ribbon bow. Great idea to leave off the sentiment, I think it's handy to have a few blank cards ready to go for any occasion. Great job! Beautiful card. Great image and coloring. This card is just stunning. So glad you shared over at Catch the bug. Wow! This is gorgeous, Janice!!! I love the image and your paper!! 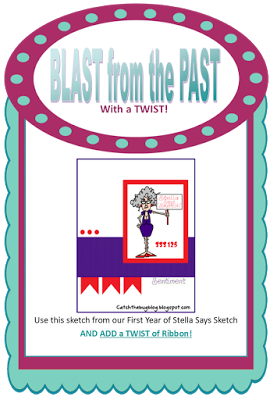 Thanks so much for Joining in our SSS at Catch The Bug Challenge Blog! I love your project! hope you will join us again very soon!